As I mentioned previously on my Twitter time-line, yesterday was a Catholic holiday: Ferragosto in Italy (end-of-summer, woe betide whoever has to work that day, etc. ), but more generally the holiday which celebrates the Assumption of Mary into Heaven. 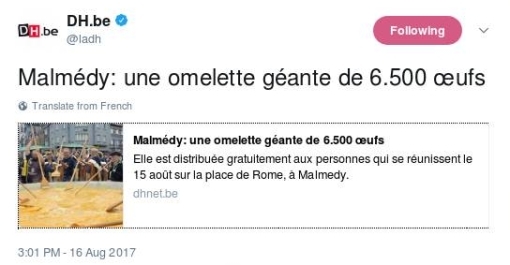 Turns out, in the Ardennes town of Malmédy in Belgium each August 15 is marked by a special ceremony in which a huge public omelet is cooked in one of the main squares, la Place de Rome, and then cut up and handed out for consumption by whoever is present at the time. Hold on, though: if you have been keeping up with current European affairs (certainly on this weblog), there should be alarm-bells ringing. Fipronil! What about that? The egg-poisoning scandal that has by now spread from its origins in Netherlands/Belgium to infect most other EU member-states as well as other countries who are the EU’s agricultural customers. But no, tradition demanded that, once again in mid-August, a huge cooking-pan be set up in Rome Square, ready to process thousands of eggs (as well as 25 kilos of grease, etc. ), after volunteers had first had a cracking time that morning extracting their innards. Talk about defying Fate, about sheltering within the Mother of God’s protection! At least there was one significant difference this time: the mega-omelet was made up of around 6,500 eggs, rather than the ~10,000 that have usually been used up in previous years. Was that a concession to fipronil worries? No, the article claims; rather, the weather meant that fewer people than usual could be bothered to make the trek to Malmédy for the occasion. Admittedly, yesterday was indeed marked by a line of violent, mid-day thunderstorms that proceeded from France through the southern part of the Benelux and then hit the western part of Germany with particular force. And anyway, think about it: if they were taking the fipronil threat at all seriously, what sort of half-assed measure would it be to go ahead with cooking the omelet, but with only 65% of the usual amount of eggs? No, egged on as they were by whatever crowd that converged on the square, the assembled chefs – clothed in the customary white jackets and toques blanches – went right ahead as soon as all ingredients were ready, and were serving it out along with a piece of French bread on plastic plates by 1:20 PM. All for free, garnished with plenty of commentary about how jolly and convivial everything was (as you can see/hear in the accompanying video if you click through, and if you can understand French). You also learn from that how all eggs were sourced from the most local producers possible, from the neighbors, practically – so they couldn’t possibly have anything to do with fipronil, could they? We will see. Remember as well that so far EU and national authorities have maintained that, even if people eat affected eggs, it is unlikely that anyone would be exposed to enough fipronil to really get sick. But that’s what they would say, of course; further, it’s clear that any effects appear over time, not at once. Anyway, it’s hard to think of a better mass experiment about the risks of exposure to fipronil, under present circumstances when European authorities are still struggling to gain control over the emergency, than what we saw yesterday in Malmédy. Now to just sit back and wait; Hail Mary, full of grace . . .
Have you heard? There’s a new European food-poisoning scandal raging – “European,” well, affecting at least those countries that buy their eggs from Netherlands producers, so at least the Netherlands itself*, Belgium and probably at least Luxembourg and Germany as well. The keyword this time is fipronil, an insecticide that is not supposed to be allowed anywhere near poultry, but of course was. More specifically, a particular Dutch company out of Barneveld, the center of the Dutch poultry industry, by the name of Chickfriend (that’s no joke, see this report on the guilty parties from the NRC newspaper) indirectly bought 3,000 liters of an insecticide containing fipronil from Romania, then sold it on to its chicken-raising customers as a means of fighting that notorious chicken-pest, the blood-louse. It’s likely Chickfriend knew what it was doing; the invoices for the sales to the chicken-farmers give a name that hides the true poisonous nature of what is being sold. And now authorities are scrambling to track all the places this poison went, so that the eggs/chickens affected can be pulled from sale and/or destroyed. 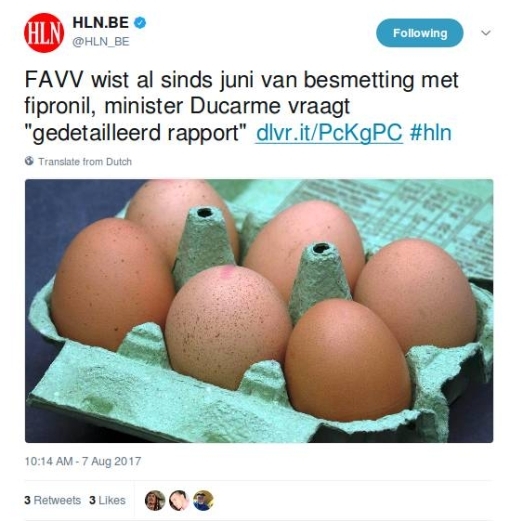 The responsible agency throughout all of Belgium for product-safety is known as the FAVV, and the headline-news is that the FAVV was aware of the fipronil appearing in eggs from the Netherlands way back in June, even though public alarm over poisoned eggs first broke out only last week. Apparently Minister Ducarme finally went this morning to the FAVV offices to read them the riot act, and later he released an official list of “57 Suspected Firms,” i.e. which are suspected of being involved with the fipronil and whose products are therefore likely to be withdrawn from sale. Further, no reports have emerged of anyone dying, or even becoming sick, from having ingested an egg poisoned with this fipronil. Surely that is just a matter of time. Meanwhile, the Dutch poultry industry has taken a big hit, several firms have already gone bankrupt (not just Chickfriend, which is of course under legal investigation) and the public health authorities in several EU lands have a mess to clean up when it comes to tracking down all the poisoned eggs. *Point of detail: “[The] Netherlands” is a name in the singular, whether in English or Dutch (Nederland), just as “[The] United States” is, at least in English. **Frankly, you’d hope Minister Ducarme had some unpleasant words for his predecessor as Minister of Agriculture, Willy Borsus, who was kicked upstairs to become Minister-President of Wallonia, a sub-state taking up around 40% of the entire country.